Hey fellow Pennsylvanians, when you see those tell-tale orange barrels—the ones that remind you that the spring road construction season is underway—you should be doing more than uttering a disgusted, "Ugh." You should also be hitting those brakes and reducing your speed. If you don't, be prepared to feel the wrath of Operation Orange Squeeze, a new safety initiative being undertaken in tandem by the Pennsylvania Turnpike Commission and state police. Why? 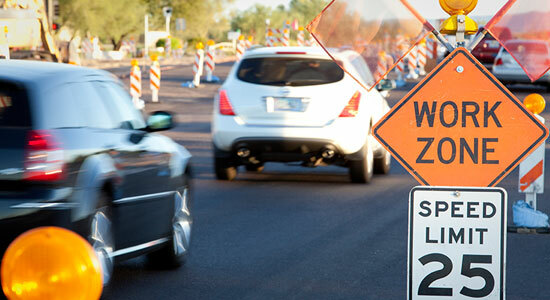 Because speeding through active work zones can be deadly. Literally. In 2015, 400 crashes took place in active work zones on the Pennsylvania Turnpike alone. Over the past five years, two Pennsylvania workers were killed in construction zone crashes. Since the inception of the Pennsylvania Turnpike, more than 30 workers have been killed in construction zones. That's to say nothing of the trouble motorists can get into by ignoring the speed limit and zooming through construction zones. If the safety and welfare of road construction workers isn't enough to get you to slow down through those work zones, you should know that the penalties for speeding through them can be steep. If you drive 11 mph or more over the speed limit in an active work zone, you can lose your license for 15 days. You could also receive a $200 fine. And as many as five points on your license. The car accident injury attorneys here at Edgar Snyder & Associates have seen what happens when people ignore speed limits and other traffic lawsin construction zones. We encourage everyone to keep an eye out for road construction workers and be mindful that you must slow down when you see the signs telling you to reduce your speed—not when road construction workers are visible. The Pennsylvania Turnpike Commission invites motorists to take its safe-driving pledge, and we wanted to extend an invite for you to join Snyder's Drivers, as well—a community of individuals committed to keeping themselves and others safe on the road. It's free to join, and when you do, we'll enter you for a chance to win prizes.